Reston, Va. – In an article published in the April issue of “The Journal of Nuclear Medicine,” researchers at Stanford University in California provide a template for assessing new positron emission tomography (PET) radiotracers that can accurately identify molecules in cancer cells that prevent the immune system from attacking the cancer. A drug that blocks a cancer’s inhibitory checkpoint molecules is called an immune checkpoint inhibitor and this form of immunotherapy has emerged as a promising cancer treatment approach. However, the lack of imaging tools to assess immune checkpoint expression has been a major barrier to predicting and monitoring response to a clinical checkpoint blockade. The study assessed practical immunoPET radiotracer design modifications and their effects on human PD-L1 immune checkpoint imaging. The researchers sought to optimize engineering design parameters including chelate, glycosylation, and radiometal to develop a non-invasive molecular imaging tool for eventual monitoring of clinical checkpoint blockade. Comparison of (A) Cu-64-DOTA-HACPD1, (B) Cu-64-NOTA-HAC-PD1, and (C) Cu-64-NOTA-HACA-PD1 ImmunoPET images acquired at 1h p.i. (~1.85 MBq/10 μg/200 μl) of NSG mice bearing dual subcutaneous tumors in shoulders (right = hPD-L1+; left = hPD-L1-). Panels left to right show representative coronal and axial cross sections of CT, PET, and merged PET/CT images with maximum intensity projection (MIP). White dashed line, coronal image, demarcation of axial cross-section; White dashed line, axial image, tumor boundary. SG, salivary gland; T+, hPD-L1 positive tumor; T-, hPD-L1 negative tumor; L, lung; Li, liver; K, kidney; B, bladder; H, heart. Scale bars represent 1 percent (blue) – 6 percent (red) ID/g. 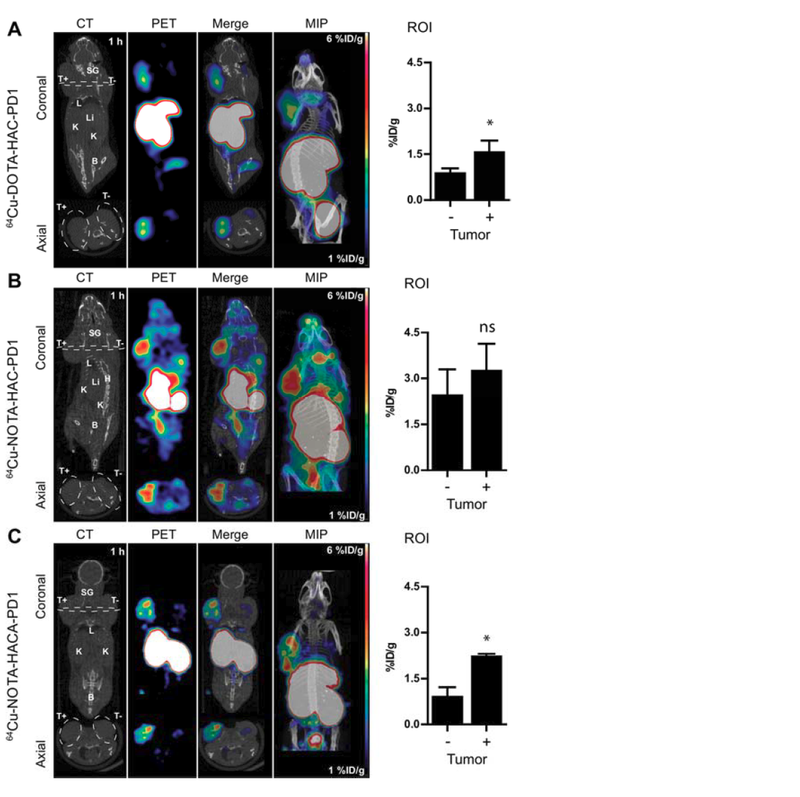 Tumor uptake was quantified using ROI analysis (right panel) without partial volume correction. Error bars represent SD. ns, not significant; *p<0.05, **p<0.01, ***p<0.001, student’s T test. The authors of “Practical ImmunoPET radiotracer design considerations for human immune checkpoint imaging” include Aaron T. Mayer, Arutselvan Natarajan, Sydney R. Gordon, Roy L. Maute, Melissa N. McCracken, Aaron M. Ring, Irving L. Weissman and Sanjiv S. Gambhir, Stanford University, Stanford, California. Support for this study was provided by Kenneth Lau, Frezghi Habte, the Canary Foundation and the Ben and Catherine Ivy Foundation. This material is based upon work supported by a National Science Foundation Graduate Research Fellowship Grant (DGE-114747) and a NIH TBi2 Training Grant (2T32EB009653-06). MicroPET/CT imaging and Gamma Counter measurements were performed in the SCi3 Stanford Small Animal Imaging Service Center.